Remy Cointreau F&B brand with market introduction of “No 28 Reserve Cellar Selection” in Australia. Increase brand awareness of Remy Cointreau overall. Promotion of “No 28” luxury product. Drive footfall to Remy Cointreau outlets at Australian airports and major cities. Compelling design of banners to capture attention of mobile users. Banner sizes between standard and interstitial to ensure best possible results in terms of impressions and clicks. Airports defined as main point of interests for the brand, hence geofences around major Australian airports. Language targeting for both tourists (Chinese) and locals (English). 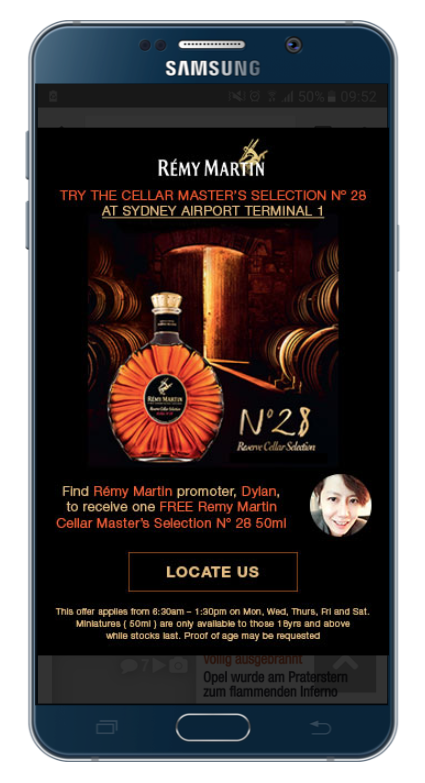 Landing page included a map of the targeted airport and photo of Remy Cointreau point of sales and even staff with the intention to direct mobile user to the Remy Cointreau outlet.